Improve your short game with our line of artificial golf turf products. You don’t have to be a golf pro to own an amazing backyard putting green. SYNLawn installs one of a kind custom putting greens designed to fit any space. Practice better. If you really want to improve your golf game, you’ve got to practice better. Take it from him, he’s Tom Watson, legendary golfer. Five-time British Open Champion, two-time Masters Champion, U.S. Open Champion with 39 PGA Tour wins. He knows a thing or two about golf, and he practices at his custom installed SYNLawn Golf practice facility. Think about it, if you practice badly you will perform badly. that makes the real difference in your golf game. Introducing the Elements of Practice designed by Dave Pelz for improving your short game. Precision installation services provided by certified SYNLawn GreensMaster™ professionals. Ongoing research by Dave Pelz and the Pelz Golf Institute for continued real golf performance. You don’t have to be a professional to have an amazing backyard putting green. Here Dave Pelz takes us on a tour of his home and discusses the intent behind his greens and why he only uses products by SYNLawn Golf. With each putting green, bunker and target Dave Pelz transformed his backyard to what has become labeled as the “World’s Greatest Backyard if you’re a golfer” by the Wall Street Times. Only services by a SYNLawn GreensMaster™ Certified professional ensures the highest quality installation of our synthetic putting greens with the most realistic golf performance for our customers. Create the backyard of your dreams with a Custom designed putting greens specifically designed to improve your game in the space of your own home. Great for practice and entertaining, it’s the ultimate golfer’s haven. Create a professional grade putting green almost anywhere with our tool-free, easy-to-assemble DIY putting greens including the Dave Pelz GreenMaker putting green system. 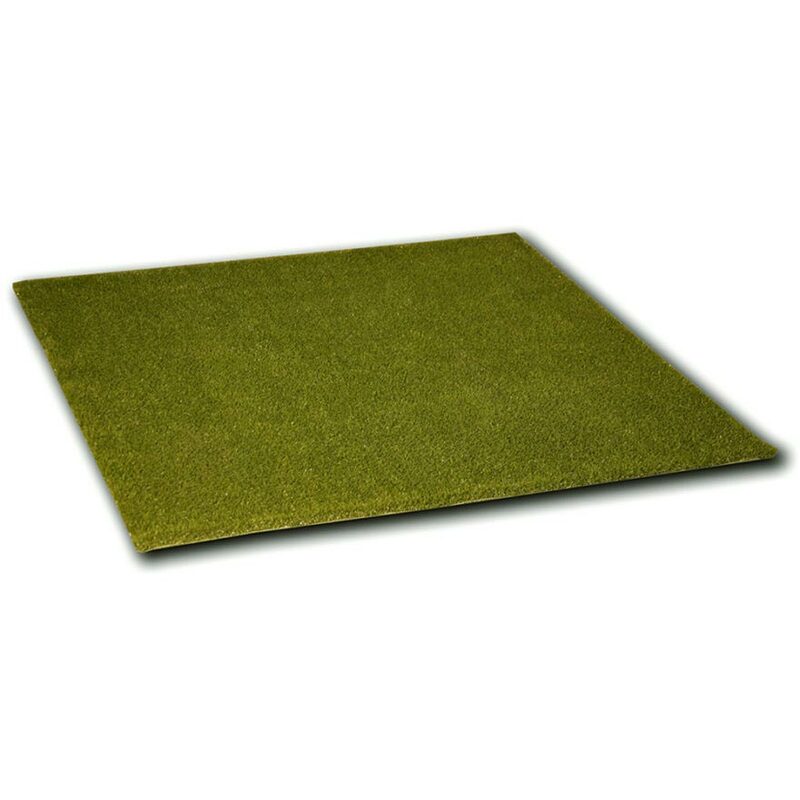 Practice virtuatlly anywhere there’s a flat surface with our Portable Mats & Greens. 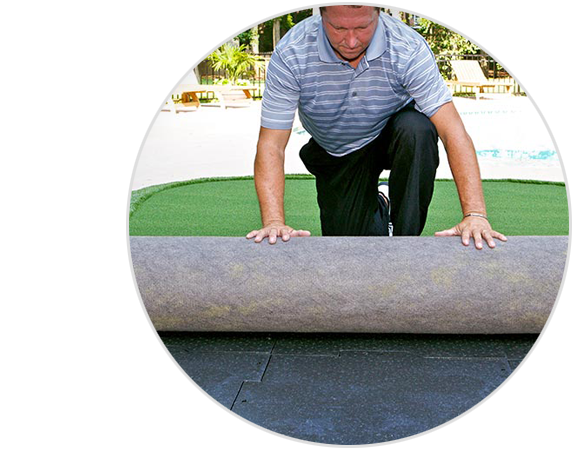 Practice your short game at home or the office, or practice your swing on one of our fairway mats. Not just for residential use, SYNLawn Golf offers Commercial grade golf grass products including the SYNLawn Tee Strike able to accept real Golf Tees, won’t grab and will last for years. 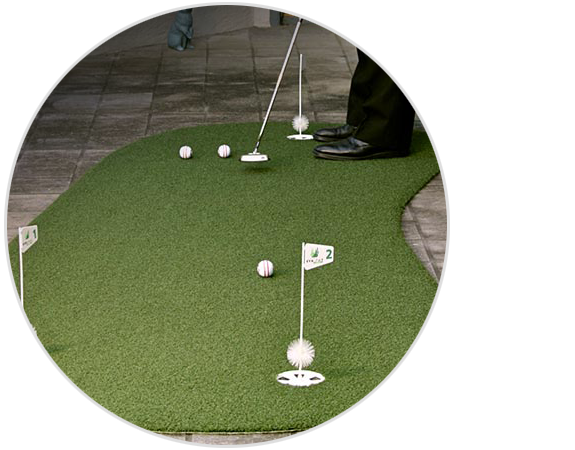 SYNLawn Golf can help you improve your short game and take strokes off your score without ever leaving home! 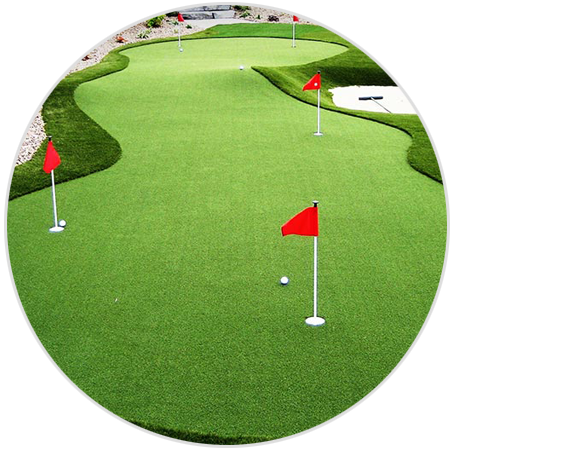 SYNLawn Golf manufactures and installs the highest quality customized home putting greens customized home putting greens and portable practice putting mats to create a golf experience that’s anything but artificial. Our custom putting greens and do-it-yourself GreenMaker™ putting green kits enable you to develop real golf skills that you can use out on the course. SYNLawn Golf backyard putting greens are custom-built to exacting standards with quality synthetic grasses made by SYNLawn, the largest manufacturer and installer of synthetic grasses in North America. SYNLawn Golf products feature grass blades made from nylon, a material that’s far superior to polypropylene grass for mimicking the characteristics of natural grass surfaces. 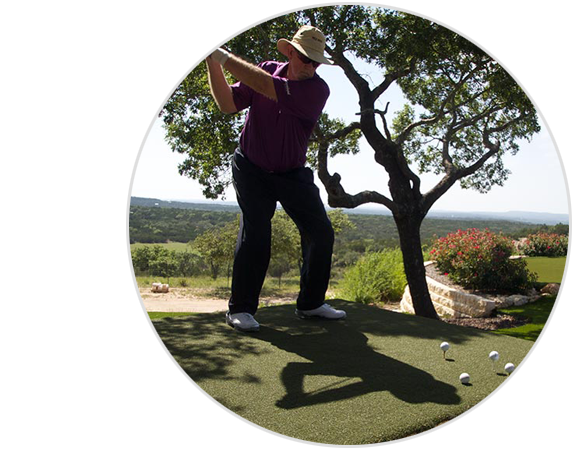 SYNLawn Golf works in partnership with noted golf instructor and short game guru Dave Pelz, founder of the Pelz Golf Institute in Austin, Texas. A former NASA physicist, Dave Pelz has worked with us to engineer outstanding synthetic grass products that not only look and feel real, but also perform like natural golf surfaces. With a SYNLawn Golf green in your home or yard, you’ll get realistic practice that really counts. SYNLawn Golf and the Pelz Golf Institute have developed synthetic grasses that provide the most authentic experience for every phase of the game. We make high-performing materials not just for smooth greens but also for lifelike fringe and collar turf, realistic fairways and demanding rough. We even carry artificial grasses that are tough and resilient enough for use in commercial tee lines and driving range mats. 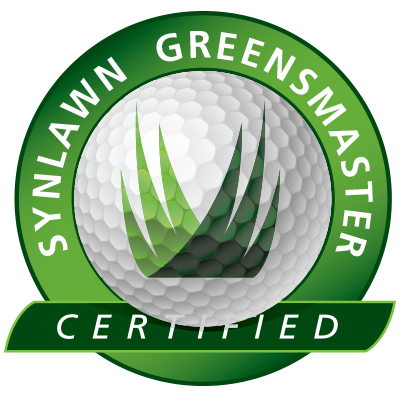 SYNLawn Golf has a quality practice golf green for any space or price range, from indoor portable golf greens and putting mats to complete custom layouts installed by professionals certified through our exclusive SYNLawn GreensMaster™ program. For do-it-yourselfers, we sell the GreenMaker™ Putting Green System, a DIY putting green kit designed and engineered by Dave Pelz. Whichever you choose, you’ll have the advantage of being able to practice critical short game shots without ever leaving the comfort and privacy of your own home. Whether you’re a serious golfer or you’re strictly out for the fun of the game, you’ll love playing on your own putting green from SYNLawn Golf. And as much as you’ll enjoy the convenience of practicing in your own house or yard, you’ll enjoy your lower scores even more. Call SYNLawn Golf at (866) 796-5296 (866-SYNLawn) today.